Using a novel application of magnetic force, researchers from Vanderbilt University have developed minimally invasive surgical instruments that could be more effective and easier to use than current technology. By passing magnetic fields through tissue, the instruments can be operated without being physically manipulated, which could reduce the incisions required and improve function. Minimally invasive surgery (MIS) is so named because it uses much smaller incisions than traditional methods. By reducing the trauma of opening the entire abdomen, patients who undergo MIS are able to recover much more quickly, with significantly lower risk. Typically, two or three small incisions are used to access the surgical site, which is operated on by long instruments that pass through the abdominal wall. Reducing the number of incisions required promises to make these surgeries even less invasive, thus increasing the benefits to the patient. Designing instruments for effective-single incision surgery poses several unique challenges. To overcome these, Vanderbilt engineers developed a new device that uses magnetic force to steer surgical instruments, according to a recent Vanderbilt news story. A key shortcoming of existing technology is that the current-generation of small actuators is not powerful enough to manipulate tissue in single-incision surgery. Access ports that allow the instruments to pass through the abdominal wall only allow very small devices with very small actuators, which can generate very little force. Using magnets, however, the Vanderbilt team designed an instrument that can be passed through the small incision but is actuated from outside the body by a magnetic force that is applied through the tissue. The team published its findings in the Journal of Medical Devices. One magnet secures the instrument to the abdominal wall, while the other transfers motion to a mechanism that provides retraction of tissues at the operative site. The device is cylindrical and measures only 154 mm in length and 12.5 mm in diameter. Weighing 39.6 grams, it is capable of lifting more than 10 times its own weight, a quantity that is clinically relevant in a retraction scenario, as demonstrated by the team in an animal model. Magnetic force drops dramatically as the distance between objects increases. This was studied in another paper published by the team in IEEE Transactions on Robotics. While 1.5mN·m of force was generated at distances up to 7 cm, at 2 cm, the device was able to generate up to 13.5 mN·m. This is much greater than a DC actuator could create when constrained by similar geometries. Since many patients have abdominal walls much thicker than two centimeters, the team has turned its focus to pediatric applications. The abdominal walls in these settings are much thinner, which makes the 2-cm limit a viable option. 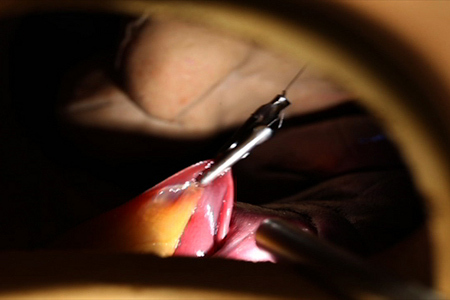 In addition to the instruments used in MIS applications, cameras are a critical element of such procedures, as they enable surgeons to visualize the surgical field. There would be several advantages to making cameras smaller as MIS becomes even less invasive. For example, a miniaturized camera the size of a grain of salt was recently developed to meet this need.